﻿So you want more bang for your genealogical buck? Well you can increase your chances of getting answers to questions about your ancestors by expanding your target from individuals to groups. Working with the census brings up a key research technique – looking at neighboring families for clues to your target family. I was first introduced to this technique by my good friend and fellow genealogist, A.S. She showed me how to make a linkage diagram listing extended family members and neighbors living near them as shown on the census and ﻿ ﻿other documents, such as land records . Then as you continue your research, you try to draw relationship links between these people. When you find a family of interest on a census, be sure to check back three-four pages and forward three-four pages to search for related families. I have come across the term “cohort” used in research studies to mean a group that shares a common characteristic such as age or gender. This commonality allows researchers to observe how the group reacts over time to different stimuli as compared to other groups. I have found this idea of cohort group to be useful in genealogy to describe families that have been found living near each other over many years. These cohort families sometimes knew each other back in their countries of origin. They may have emigrated together. After they came to America, they moved together in search of better opportunities. Often they shared the same religion. They bought land next to each other. They intermarried. ﻿﻿﻿﻿﻿﻿﻿A wonderful resource on this topic of cohort families is Emily Anne Croom’s book The Sleuth Book for Genealogists: Strategies for more successful family history research. In Chapter Three “Broadening the Scope: Cluster Genealogy” pgs. 40-53, Ms. Croom explains why we should study our ancestors not in isolation but in “clusters”, which she defines as “…relatives, neighbors, friends, and associates.” (p. 40). ﻿﻿﻿﻿﻿﻿﻿﻿ I have experienced first hand the joy of finding answers to genealogical questions through cluster research many times. One recent example happened when I was searching for Irene Kreis' (my paternal grandmother), birth certificate. I was hoping to find my Henry Kreis' (my paternal great grandfather) birthplace listed. I had already seen his birthplace given in several census documents as “St. Louis”, but I have learned one golden rule of genealogy – always try to substantiate facts about your ancestor with several documents. I knew Irene had siblings, including a brother named Lawrence, from her mother’s divorce record. 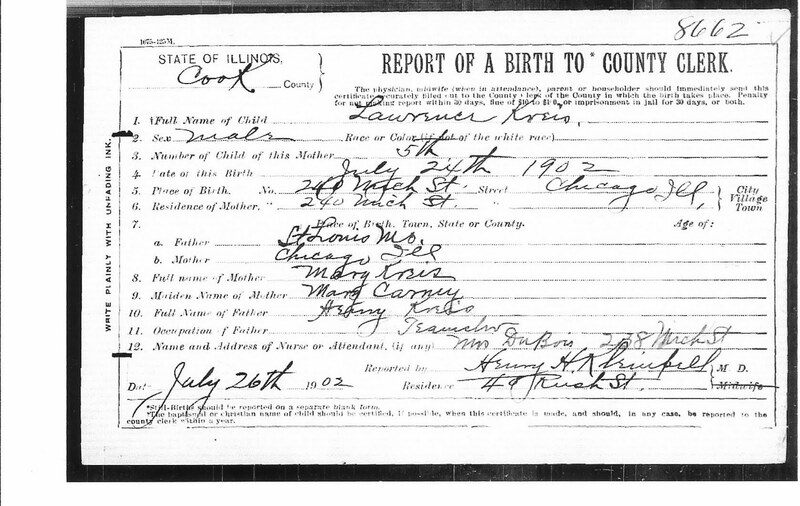 I went to FamilySearch.org and found a birth record for Lawrence Kreis. 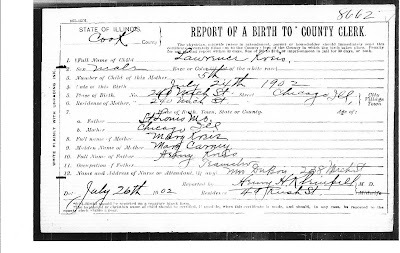 I learned several good pieces of information: the exact birth date of Lawrence, the address of the family at that time, corroboration of Henry’s birth place, and even Henry’s occupation (Teamster), all of which I would have missed if I had stopped my search for birth records when I could not find Irene’s.